February 2016 Digital Issue: What's Your Story? Covering innovation stories in this industry is oftentimes one of the most interesting parts of my job. The best products can come from a simple idea, an impulse or even by accident – think about how many times in history a scientist or researcher stumbled upon something much greater than they could have ever imagined. 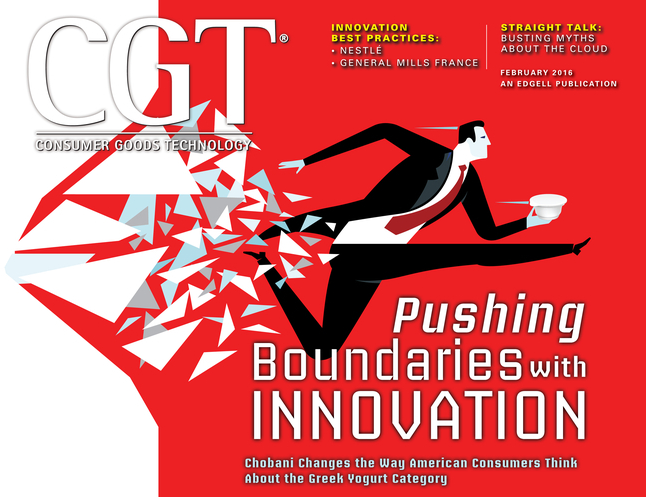 This month’s cover story with Chobani is a great example. The story starts with Founder Hamdi Ulukaya, a Turkish immigrant/entrepreneur who rose to fame for introducing mainstream America to Greek yogurt in 2007. Here, we cover the company’s journey from humble beginnings (when they spoke at our Sales and Marketing Summit in 2012 about their early experiences with social media) to a campaign that boosted sales 300 percent. General Mills France had a more technology-driven approach to its latest ice cream innovations, using cloud-based 3D modeling and visualization applications to accelerate growth for the Hagen-Dazs brand. Meanwhile, Gerber has invested more than $100 million in tech to reveal its latest category innovation, satisfying tiny tastes. Whether you’re keeping in the health trend (anyone still keeping resolutions? ), making an impulse buy for some ice cream, or searching for the next great product, we’ve got you covered. Read through the pages of this issue and we’re sure you’ll find some inspiration (or at least a new product to try next time you shop). Have a story to share? Let us know about it: [email protected] We may be able to tell your story next!